Kefir is a fermented milk drink originating in the Caucasus. It is liquid, thicker than milk, sour, and a little yeasty. It can have small amounts of alcohol, but typically much less than ½% by volume. It is traditionally fermented using kefir grains, a symbiotic culture of yeasts and bacteria passed down from generation to generation. Remove kefir grains from previous batch of starter, using a sieve or colander. 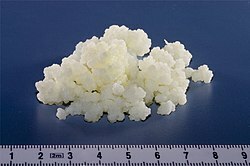 Kefir grains are gelatinous lumps. You can often get them for free, or for the cost of postage - see link below. Once you've got some, they grow in the milk until you have enough to give to someone else. As an alternative to kefir grains, some health food shops carry a powdered kefir starter. This will never make kefir grains, but the powdered starter will make good kefir and is easier for some people to manage. Milk can be almost any milk from a mammal. Full cream cow's milk is best, but kefir can be made from low-fat milk, goat's milk, or sheep's milk. Non-milk kefir can be made from sugary water, fruit juice, coconut juice, rice milk, or soy milk. However, the kefir grains will stop growing in these liquids, so it is best to only use excess kefir grains or powdered kefir starter for this. In warm weather, kefir will ferment very quickly and can become separated into curds and whey. An easy way to prevent this is to start the new batch of kefir at night, when it's cooler, and put the fermenting kefir into the refrigerator during the daytime when it gets hot. When kefir grains are not in use they may be stored wet or dry. They can be stored wet up to 8 to 10 days in water at 4°C. Alternatively they may be wrapped in cheese cloth and allowed to dry for 36 to 48 hours at room temperature, and these dried grains may be stored at room temperature in an envelope for 12 to 18 months. Dried kefir grains may be reactivated by several successive growth cycles in milk. The grains are ready for kefir production when the kefir they produce looks and smells like the original (wet) form. This re-growth stage is required to re-establish the correct bacterial balance within the culture. Kefir grains may become contaminated with undesirable bacteria such as coliforms and other spoilage bacteria that shorten the kefir shelf-life. To guard against this, kefir-making containers should be washed and sanitized prior to making kefir. Suitable containers include glass jars such as jam jars or pickle jars, but any suitably sized glass container will work. When necessary to wash kefir grains they should be also washed in pre-boiled and chilled water or fresh milk. Use of chloraminated tap water should be avoided, but if necessary it should be de-chloraminated. To make kefir, milk should be inoculated with kefir grains (5% w/w) and incubated until a smooth yoghurt-like consistency develops. This is generally 12 hours at 18 - 22°C. Carbonated kefir may be produced by sealing the fermented product into beer bottles for ripening (1 to 3 days at 10°C). Kefir should be kept out of direct sunlight. If you have no means to regulate the temperature of fermentation, then the top of a warm refrigerator or a cupboard above the stove are suitable places. In warm to hot climates, kefir may be produced by placing the fermentation vessel into the refrigerator during the day and on the counter top at night. Strain the prior day's kefir batch with a sanitized sieve. Return the grains to a sanitized glass jar. Add fresh pasteurized or raw milk, and cover loosely. Enjoy the liquid kefir portion that went through the strainer. Leave the new batch to sit and ferment. Available commercial starter cultures do not make traditional kefir. These starters contain selected bacteria and yeasts isolated from kefir grains and will not produce kefir grains. These starter cultures result in a more consistent product as opposed to traditional kefir which varies from batch to batch. If you have left your kefir to ferment for too long the kurds and whey will start to separate. Adding some additional milk, with a vigorous stirring, to dilute it can remedy this. Kefir can be used as a leavening agent when baking bread, because it contains active yeasts and bacteria. It can be used directly in a recipe, by replacing the yeast and half the water with kefir. Recipes that specify buttermilk or yoghurt can be made just as well (or better!) with kefir. Alternatively, kefir can be used to create a sourdough starter. Add ½ teaspoonful of kefir to ½ cup flour and ½ cup water, mix well, and set aside to ferment for 12 - 24 hours. Kefir is delicious when consumed on its own, but it also makes a brilliant base for flavored milkshake or lassi-like drinks. A good dash of elderflower cordial. A shake of ground nutmeg. I have noticed a rather strange thing happening to this combination of kefir and spices. After about 3 or 4 days being carried around in my bag (it takes me a while to get through it), the cream in the kefir spontaneously forms little spicy buttery globules that float on top (This is the kefir separating into curds and whey!). They are slightly similar in shape to popcorn, and between the size of a pea and a grape. I think the agitation caused by being in my bag whilst walking may play a part in their formation. They're lovely to eat, spicy and creamy if you are brave enough to eat them. You could also skim them out and then you've got naturally fat-reduced kefir (if that's your thing).